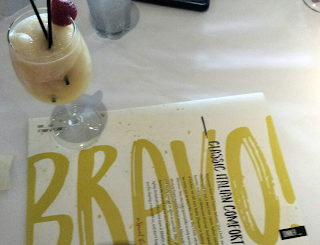 I hadn't been to Bravo Cucina Italiana restaurant since I judged their chef competition a few years back. 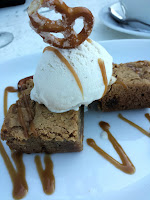 So, when invited to check out the new Savory Summer Nights menu, I accepted and stopped in for a bite. For those who have not eaten at Bravo, each restaurant is allowed to tweak the menu slightly, which you will want to keep in mind while scanning the online menu. The most noticeable difference, I found, is the wine list. I tasted a couple appetizers, three entrees, a salad, and a dessert or two. Also, a peach Bellini found its way to my table, along with a wine I selected from the list. The service was friendly and casual ~ don't dine here if you prefer the more formal atmosphere and staff. 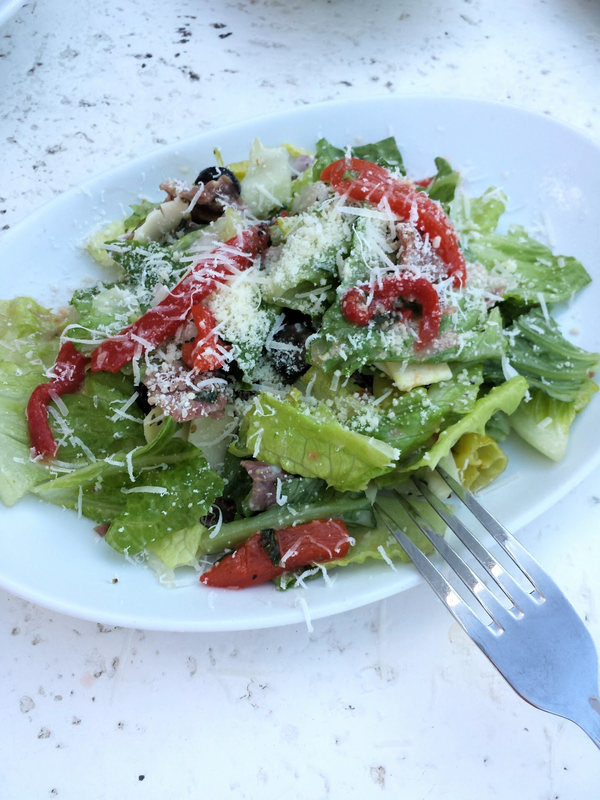 Antipasti Salad: Romaine, sopressata, Provolone, pepperoncini, red onion, black olives, marinated red peppers, basil, oregano, red wine vinaigrette ($5.99). Well priced and large in size, I recommend sharing this if you plan on having any apps and entrees. Calamari Fritti: Creamy horseradish, Pomodoro sauces ($12.29). Again, portions are meant for sharing, and the horseradish sauce is not too hot for enjoyment. Crispy Shrimp Napoli: Green onions, charred tomato Napoli sauce ($12.99). Although I soldiered on with entrees, I could have stopped after these two appetizers and been perfectly content with the flavors, quality and value. 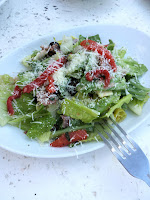 Plan on sharing, and eating with a fork, rather than a finger food style appetizer. Grilled Chicken with Sun-Dried Tomato Goat Cheese: Herb marinated chicken breast, pesto bread crumbs, Yukon Gold mashed potatoes, haricot vert, lemon butter ($14.99). This is definitely my favorite (not counting dessert) food tried. The flavor combination was balanced and the chicken juicy. 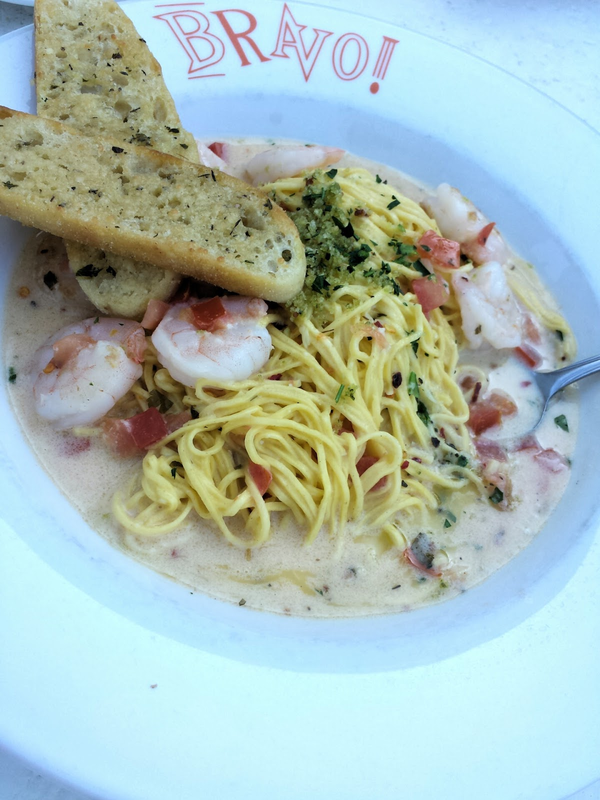 Shrimp Scampi Pasta: Fresh capellini, tomatoes, lemon, white wine, chili flake, pesto bread crumbs, garlic crostini ($13.99). 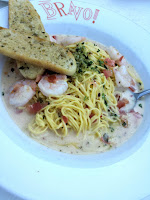 The lemon and white wine sauce is simply divine with the capellini pasta and flash seared shrimp. I would like to see the shrimp grilled instead, which would add a nice layer of flavor to this dish. 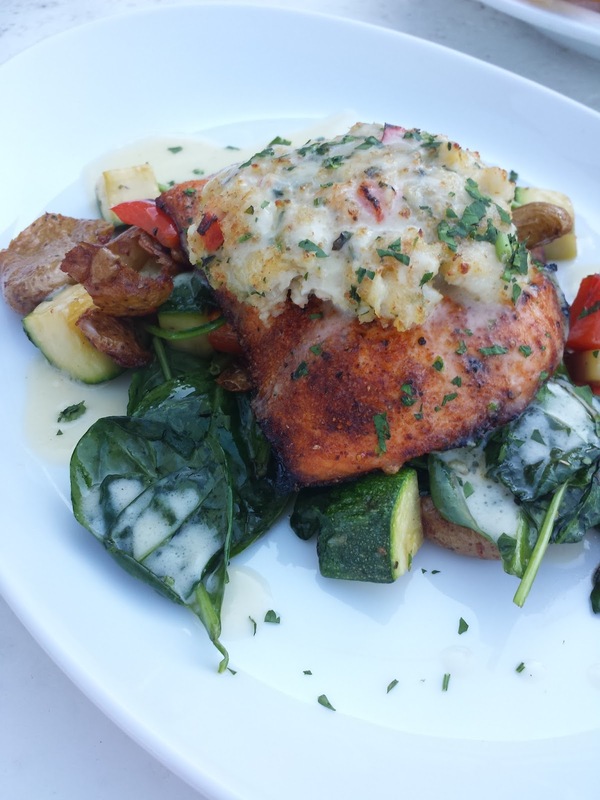 Crab Crusted Salmon: Roasted red peppers, zucchini, spinach, lemon butter, crispy fingerling potatoes. This is definitely for the heat lover with the Cajun spices on the farm-raised salmon. Warm Cookie Butter Blondie: Vanilla bean gelato, cookie butter caramel, and sugared pretzels ($5.49). Served warm, the brownie was the perfect ending for the meal ~ and created an unsharing streak in me. With vanilla bean gelato atop, melting slowly into the blondie, this is considered a two-spoon dish for good reason. Drinks: Peach Bellini: (Pictured at top of page) Slushy-style and garnished with a fresh strawberry gives this drink the extra touch to make it a hot-afternoon must. Wine: Although the list was Sauvignon Blanc-heavy, I found a bottle of Chardonnay from Sicily (Porta Palo $26), which was absolutely delightful. Tropical fruit forward, the white wine is thirst quenching and pairs perfectly with all three entrees. The only downside is the price on the wine, which is triple retail (This is typical in restaurant, btw). 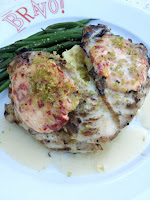 Bottom Line: Bravo's Savory Summer Nights menu offers a value-driven menu for the Italian foodie.